Since the mid-1950s, Massachusetts has seen a growth in the production of studio furniture. Many influential makers who trained and worked in the Bay State, like Tom Loeser, Alphonse Mattia, and Rich Tannen (Fig. 1), have carried forward the tradition by teaching furniture design in schools around the country. Today, studio furniture in Massachusetts spans the stylistic poles—from interpretations of historical prototypes to nonfunctional, sculptural, and conceptual works—earning its makers national and international acclaim. Made in Massachusetts: Studio Furniture of the Bay State, at Fuller Craft Museum, in Brockton, Massachusetts, presents thirty-nine artists’ works built in Massachusetts that express the diversity and quality of contemporary studio furniture in the state. Represented works range from examples inspired by makers of the Federal period like Samuel McIntire of Salem to non-functional, sculptural, and conceptual works. Collectively, they document the range of materials, forms, and styles that give furniture its special nature (Fig. 2). (b. 1948), Library Steps, Boston, 1984. Cherry; 60 x 17½ x 25 inches. Fuller Craft Museum, 1984 commission with funds provided by Massachusetts Council on the Arts and Humanities, New Works Grant (1984.2.6). Photography by Alex Hochstrasser. Fig. 2: Jay Stanger (b. 1956), Arched and Animated, Easton, 1994. Dyed veneers, anonidized aluminum; 52 x 27 x 25 inches. Fuller Craft Museum purchase with funds provided by the deacession fund (2012.6). Photograph by Dean Powell. Fig. 3: Miguel Gómez-Ibáñez (b. 1949), interior of Escritorio (Alphabet Writing Desk), Boston, Massachusetts, 2008. Walnut, ebony, mother-of-pearl, Carpathian elm, oak burl veneer; botanical paintings by Joseph W. Reed; 56 x 42 x 19 inches. Collection of the artist. Photograph by Dean Powell. Contributing to the strength of the studio furniture movement in Massachusetts has been the number of educational environments that have done much to encourage artists. The current cabinet and furniture making program at North Bennet Street School in Boston, incorporated in 1885 to provide vocational training to immigrants, has been shaped by influential teachers, many of whom are represented in the exhibition. These include Alex Krutzky, Philip Lowe, Will Neptune, Richard Oedel, Lance Patterson, and current director Miguel Gómez-Ibáñez. For his Escritorio (Fig. 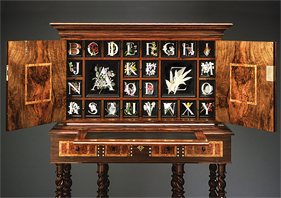 3), Gómez-Ibáñez dipped into his heritage to reinterpret a seventeenth-century Spanish high-style writing desk with formal garden motifs on the doors and a modern painted botanical alphabet ornamenting the drawers within. 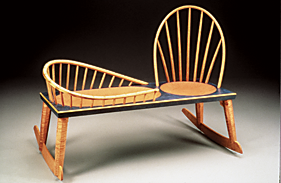 Nineteen years ago Philip Lowe, embarked on his own and opened The Furniture Institute of Massachusetts in Beverly, where students are taught both the art of classical woodworking techniques and functional contemporary furniture design and construction (Fig. 4). Fig. 4: John Cameron (b. 1959), Saturn, Gloucester, 2010. Walnut, European walnut, ash, butternut, nickel, silver; 67 x 39 x 17. Collection of Shannon Chandley and Tom Silvia; photography by Bill Truslow. Cameron is an instructor at FIM and an independent cabinetmaker in Gloucester. The seminal force for contemporary design has been the Program in Artisanry that operated at Boston University from 1975 to 1985, where Jere Osgood, founding director, and Alphonse Mattia, served as instructors. The program was reestablished at the Swain School of Design in New Bedford, which, in 1988, merged with the University of Massachusetts, Dartmouth. Until his retirement in 2010, Stephen Whittlesey, an elder statesman of furniture design and philosophy, trained students to discover and reveal meaning in cast-off materials. As with North Bennett Street School, students learn furniture making as well other craft disciplines. In the early 1980s, when the studio furniture movement was gaining momentum, museums in Massachusetts acknowledged the swelling pool of talent with exhibitions. 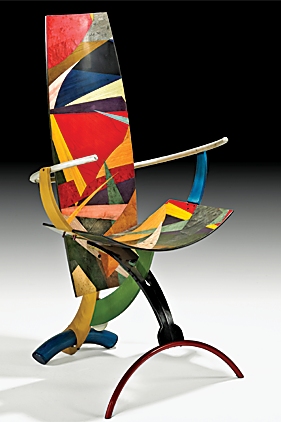 In 1984, Fuller Craft Museum (then known as Fuller Museum of Art), with funds provided by the Massachusetts Council of Arts and Humanities New Works Grant, commissioned significant works by several important furniture artists, among them Judy McKie (Fig. 5), Rosanne Somerson, Kristina Madsen, and Rich Tannen (see fig. 1). Five years later the Museum of Fine Arts, Boston, presented its landmark exhibition New American Furniture. The MFA in 2003 revisited the subject with The Maker’s Hand, where some of the artists in the current Fuller Craft show were again represented. Fig. 5: Judy Kensley McKie (b. 1944), Glass Top Table with Dogs II, Cambridge, Mass., 1984. 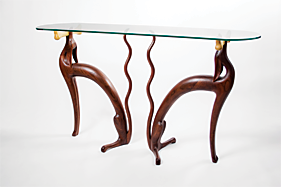 Walnut, ash, glass; 34 x 60 x 178 inches. Fuller Craft Museum, 1984, commissioned with funds provided by the Mass Council on the Arts and Humanities, New Works Grant (1984.2.3 a-c). Photography by Alex Hochstrasser. Fig. 6: Peter Dean (b. 1951), Tempietto Table, Charlestown, Mass., 1992.Indian rosewood, holly, ebony, sierra madrone burl veneer, purple heart, pearwood, inlaid woods; green pearl granite; 17¼ x 54½ x 26 inches. Private collection. Photography by Alex Hochstrasser. Fig. 7: Silas Kopf (b. 1949), Aquarium, Easthampton, Massachusetts, 2011. 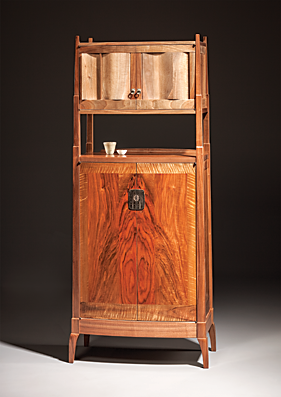 Cherry, aspen crotch, granadillo, satinwood; marquetry of various woods; brass, mother-of-pearl, stone; aromatic cedar; 47 x 38 x 16 inches. Fuller Craft Museum, purchase in honor of Jonathan L. Fairbanks with funds provided by the Deaccession Fund (2012.12). Photograph by Alex Hochstrasser. 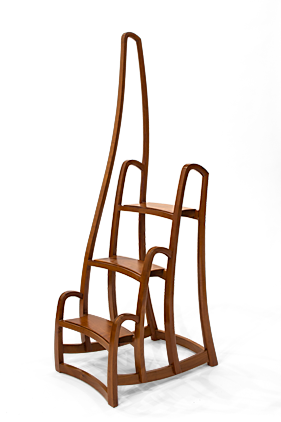 Peter Dean is one of four furniture artists in the exhibition whose architectural training has influenced their work. 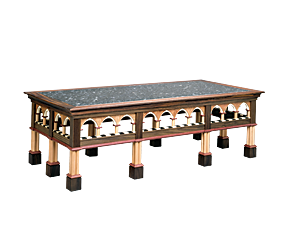 Dean’s Tempietto Table (Fig. 6) was inspired by the architectural perfection of Donato Bramante’s 1504 Tempietto, a touchstone of the Italian High Renaissance in Rome. Silas Kopf (Fig. 7), after undergraduate studies in architecture, apprenticed to Wendell Castle in the early 1980s, then learned techniques of marquetry at École Boulle in Paris and traveled widely to explore touchstones of this art form. The nautical world has influenced other furniture makers in the exhibition. John Cameron began as a boatbuilder’s apprentice (see fig. 4). Mitch Ryerson studied boatbuilding before becoming involved in designing and building furniture (Fig. 8). Tom Loeser has built boat-like furniture forms as well as functioning boats. John Everdell spent his formative years aboard a boat, which helped shape his minimalist mindset of replacing pure decoration with forms that express function. Furniture such as his Hall Table (Fig. 9), show the influence of brothers Charles Sumner Greene (1868–1957) and Henry Mather Greene (1870–1954), founders of the noted architectural firm of Greene and Greene in Pasadena. Fig. 8: Mitch Ryerson (b. 1955), Nanny Rocker, Medford, Massachusetts, 1992. White pine, curly maple, oak, milk paint, oil finish; 39 x 49 x 32 inches. The Art Complex Museum, Duxbury, Mass. Photography by Alex Hochstrasser. Fig. 9: John Everdell (b. 1948), Hall Table, Medford, Mass., 2007. Pecky English oak, wenge white oak; 27 x 27 x 16 inches. Collection of the artist. Photography by Jim Thomas. Fig. 10: Bart Niswonger (b. 1974), Ball Side Table, Worthington, Mass., 2012. Ash, maple, cast urethane, paint; 22 x 18 x 24 inches. Collection of the artist; courtesy of Gallery NAGA. Photography by Bart Niswonger. Many studio furniture artists use non-traditional materials. Bart Niswonger’s Ball Side Table (Fig. 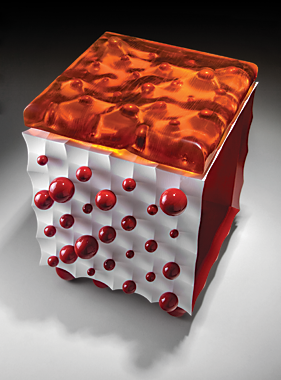 10) is comprised of cast clear urethane elements in roughly textured wood molds. Jay Stanger employs steel and aluminum with polychrome wood veneers and NASA-inspired ergonomics in such works as Arched and Animated (see fig. 2) to evoke the chaos of modern life melded with dynamic energy of abstract expressionist painting. 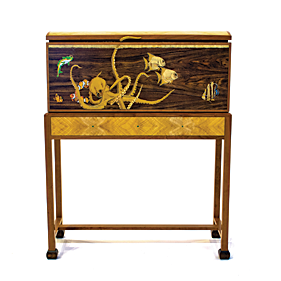 Massachusetts studio furniture artists continue to present visually stunning and creative works that add an important component to the state’s history of furniture production. 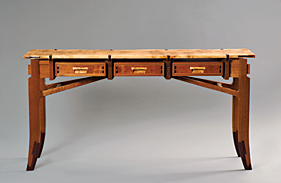 Made in Massachusetts: Studio Furniture of the Bay State is one of eleven institutions comprising Four Centuries of Massachusetts Furniture (www.fourcenturies.org) that extends through 2014. Made in Massachusetts is on view at Fuller Craft Museum, Brockton, Mass., from October 12, 2013 through February 9, 2014. For related programs at Fuller Craft call 508.588.6000 or visit www.fullercraft.org. Jeffrey Brown is curator at the Fuller Craft Museum, Brockton, Massachusetts.